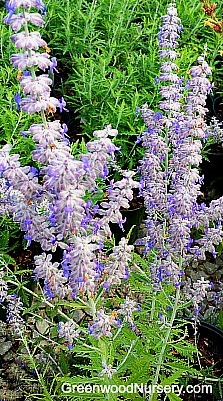 The Dwarf Russian Sage Lacey Blue is a favorite perennial plant that produces a bushy mound of grey green leaves topped with lavender blue perennial flowers from mid summer to frost. Perfect for butterfly gardens, small gardens, small yards and container growing. One of the most compact Perovski atriplicifolia varieties available, the Lacey Blue grows 18 to 20 inches tall with a spread of 18 to 23 inches wide in full sun and normal to sandy soils. As with most Pervoski atriplicifolia, the Lacey Blue Dwarf Russian Sage is drought tolerant once established, deer resistant, rabbit tolerant, fragrant and excellent for borders and planting en masse. The Lacey Blue is one of our favorite perennial plants. Lacey Blue Russian Sage was developed by Liss Forest Nursery in the UK. USPP#20845.